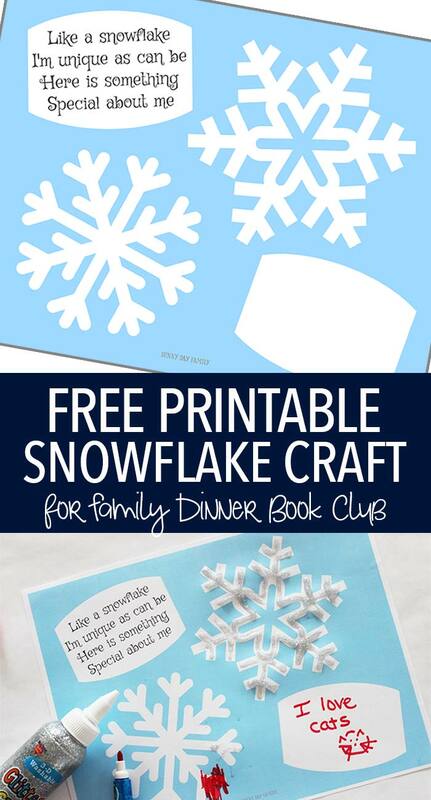 Printable snowflake for kids to decorate & share something unique about themselves! I can't believe we are wrapping up our first year of Family Dinner Book Club. This has been such a wonderful adventure and I have loved sharing books & conversation starters from Growing Book by Book, themed menus from Chef Sarah Elizabeth, and our crafts with you - everything from painting with blackberries to chalkboard cats. And I can not wait to share the excitement of next year's Family Dinner Book Club as we travel around the world - be sure to check out the super exciting freebie we have for you at the bottom of this post. This month we have another great book, delicious meal, and easy table craft for you. And since it's December, and all our calendars are full, I've made this month's craft as easy as it gets. Simply download your printable snowflake, print, decorate, and enjoy! But first, I want to share the book that inspired it. This month's pick is Snowflake Bentley by Jacqueline Briggs Martin. Snowflake Bentley tells the true story of Wilson Bentley, who pioneered the photography of snowflakes and proved that no two were alike (yet they were all beautiful). Young snow lovers, budding scientists, and kid photographers will love this award winning biography. We've put together a really fun printable that celebrates not only the uniqueness of the snowflake, but the fact that we are all unique (and beautiful) in our own way. 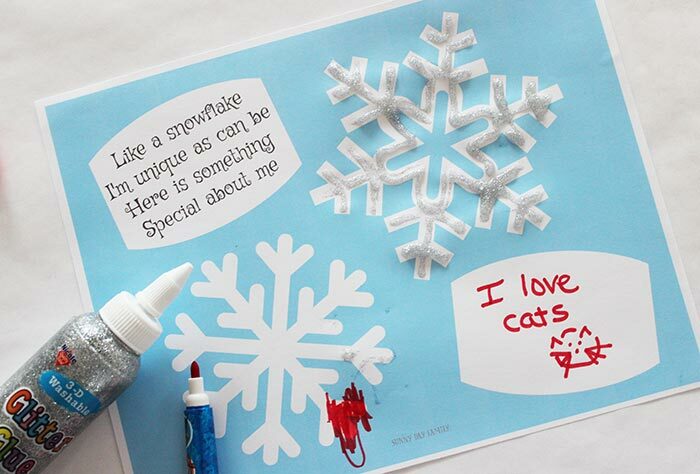 This art and writing prompt will encourage your kids to create their own snowflake art while also sharing something that makes them special too. We had so much fun with this craft. You can laminate it when you are finished to use as a placemat for your book club dinner, or hang it up as a piece of art. To get your own, simply click the button below. 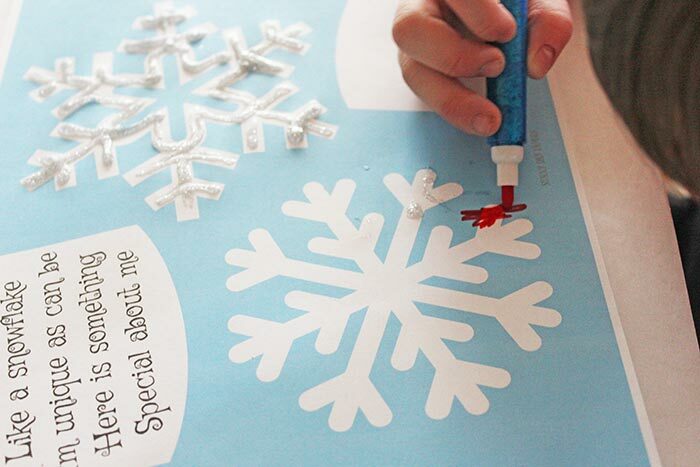 There are two parts to the printable - first, you can encourage your kids to decorate the blank snowflakes and make them totally unique. We used glitter glue and markers, but you can be creative and use any of your favorite art supplies to make it your own. You'll also find a blank space for your child to write and/or draw "something special about me." 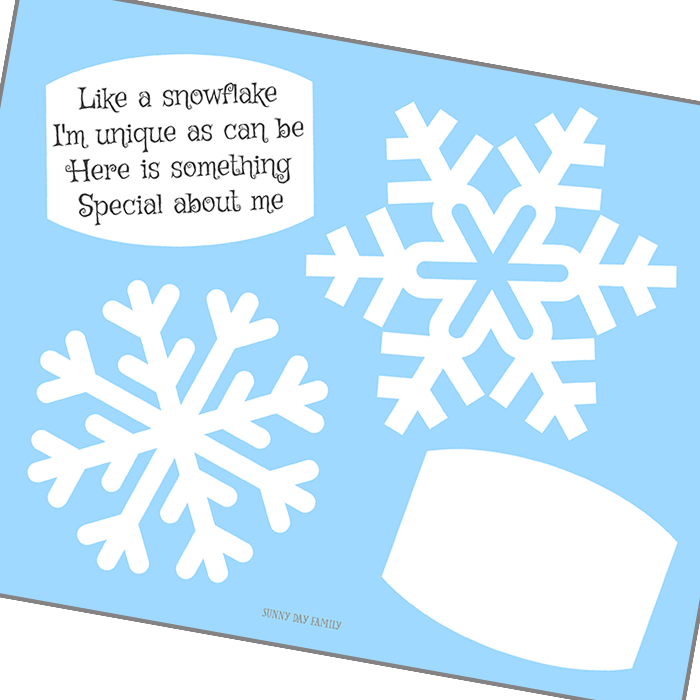 This is a wonderful way to talk about how, like a snowflake, we are all unique and special. My son decided to share his love of cats as his special quality (and he found a heart shape on his snowflake which had to be red). Once you have your printable, be sure to head over to Growing Book by Book for this month's conversation starters and service project, then to Chef Sarah Elizabeth for what is always a mouth watering themed menu.